It’s been another GUBU year in politics. WHILE LEINSTER HOUSE is a place for serious people doing serious work there’s a fair amount of absolutely daft stuff that happens every year. Despite our elected representatives fancying themselves as serious legislators they are often found engaging in the hilarious, the bizarre, the obscene and the downright outrageous. Fine Gael TD Michelle Mulherin takes this gong after she called for the installation of a ‘Skype facility’ in Leinster House following controversy over €2,000 worth of calls she made to Kenya from her office phone. Luckily we discovered that such a facility already exists. Honourable mention to Mattie McGrath who called for the regulation of ‘the twatters’. We think he meant ‘tweeters’. Gerry Adams telling the world that he trampolines naked with his dog. Eamon Ryan could barely stomach the mention of Environment Minister Alan Kelly and his record on climate change. Enda Kenny claiming that a Jaffa Cake is both a cake and a biscuit. And he seriously thinks he can be re-elected with this sort of fence-sitting? Another gong for Enda Kenny who got badly burned while trying to extend a hand to Barack Obama in the Oval Office. That’s right Enda, just stare at your immaculate fingernails. Labour and its ‘ill-advised’ #talktoJoan campaign on Twitter. Joe Higgins was one of many to use the opportunity to have a pop at the the Tánaiste. Catherine Noone reading a speech in the Seanad that was pretty much an article by Charlie Weston in the previous day’s Irish Independent. 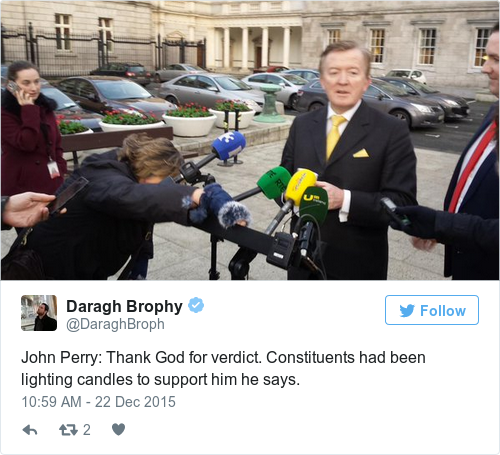 The independent TD excelled himself when it came to being thrown out of the Dáil this year. We counted at least three occasions when he took a walk, until eventually he was just ignored. Kudos to John Perry for bringing his own party to the High Court in a bid to force his way onto the Sligo-Leitrim general election ticket. “I would like to thank God for this day. This day is a day for justice,” said the delighted Fine Gael TD after his legal case was settled. Email “'Have you got the wiffy code? ': The not-so-serious 2015 political awards”. Feedback on “'Have you got the wiffy code? ': The not-so-serious 2015 political awards”.